The Sedric concept has a two-part swivel door that opens wide enough and high enough to allow for easy entry and exit. 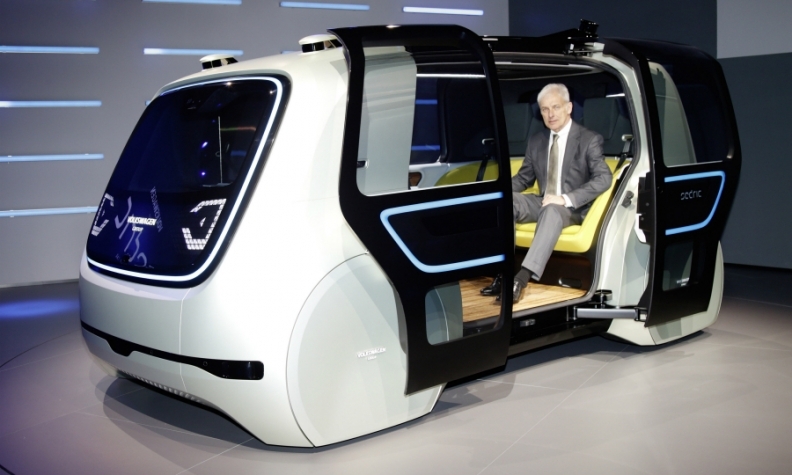 VW CEO Matthias Mueller is pictured sitting in the concept vehicle. GENEVA -- Volkswagen Group unveiled the Sedric self-driving concept car that gives a glimpse of how robo-taxis could operate in the future. The concept is a shared mobility electric vehicle designed from the start to offer the highest degree of self-driving autonomy for occupants, VW said in a statement. A production Sedric would be able to drive children to school, take their parents to the office, look independently for a parking space, collect shopping that has been ordered, or pick up visitors from a train station, according to Volkswagen -- all that the touch of a button, with voice control or with a smartphone app. The concept is a so-called Level 5 vehicle capable of fully automated operation, It is a precursor for more such models from VW in years to come, CEO Matthias Mueller said. The car was conceived, designed and developed by VW's Future Center Europe in Potsdam, Germany, and engineers in Wolfsburg. VW unveiled the concept at a press event on Monday ahead of this week's Geneva auto show. Sedric is the automaker's first group concept car. It does not have a logo from VW Group's diverse stable of 12 brands. Instead the car has the group corporate identity on the front windshield. The concept has a two-part swivel door that opens wide enough and high enough to allow for easy entry and exit from the vehicle, baggage included. VW envisions it shuttling occupants back and forth in the city, suburbs or even the countryside. Designed without the classic proportions of an automobile it lacks elements such as a hood or shoulders, enabled in part by a battery housed in the floor and a compact motor located at the level of the wheels. Pronounced flanks and vertical pillars convey a sense of strength, reliability and safety, according to the company. Since it was developed for a fully autonomous future, the vehicle also lacks a steering wheel, pedals or even a cockpit. Instead it offers two banks of two seats each facing each other in a lounge-like atmosphere as well as a user interface consisting of a single button. Air purifying plants positioned in front of the rear windshield enhance the effect of generously dimensioned bamboo charcoal air filters. Occupants meanwhile can gaze out into the surroundings thanks to large windows and a high-resolution screen featuring organic light-emitting diodes (OLED). The vehicle allows for individuals with only limited access to transportation the ability to be chauffeured to a destination of their choice. The vehicle for example is equipped with a vibration signal that guides people with impaired vision to the car. For those customers that may wish to own a vehicle, Volkswagen said Sedric could also be configured individually to meet the personalized tastes of its user. "We're convinced that fully autonomous vehicles will make life in our cities better, more environmentally friendly and safer. Sedric offers the first concrete outlook," Volkswagen Group CEO Matthias Mueller said. "Just to ensure there is no misunderstanding, the Group will not build vehicles in the future - that task best remains with the brands, but our concept car represents a new self-perception as well as a new form of cooperation and knowledge transfer in the group."